Before Europeans arrived in North America, a vast network of grizzly bear trails existed between California and Alaska. Today, the southern extent of the grizzly’s coastal range has been lost to logging and urbanization while hunting extirpated the bears themselves long ago. Today, only a few isolated habitats are occupied by grizzlies below the 49th parallel. This is one reason why the Great Bear Rainforest is critically important – it acts as a stronghold for the southern range of North America’s coastal grizzly bear population, supporting Canada’s largest and densest concentrations of grizzlies. 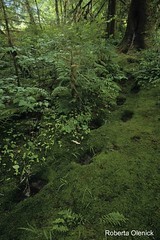 Stomp trails like this were created by generations of bears following exactly in each other’s footsteps. Our vision is to ensure that coastal grizzlies continue their presence as the top carnivore and apex predator in the coastal rainforest. Their challenge is to survive cumulative threats to which they have no evolved defenses – diminishing salmon resources, rapid climate change, industrial forestry, trophy hunting and global pollutants. We must fully consider these impacts to take informed action that will ensure their long term survival. For the last 20 years, Raincoast has worked persistently to remove and reduce the two largest threats to the long-term presence of grizzlies in the Great Bear Rainforest (GBR) – habitat loss and hunting mortality. In November 2017, the BC provincial government announced their commitment to finally end the trophy hunting of grizzlies in the GBR. We will work alongside the province and First Nations to complete our acquisition of commercial hunting territories thus ending both the ‘Resident’ and ‘Commercial’ hunt in this antiquated ‘sport’ on the coast. Increasingly, declining salmon stocks and climate change are superseding the historical threats to grizzly survival. For over a decade, Raincoast has lead the campaign to stop the trophy hunting of grizzlies through purchasing the rights to commercial hunting territories. Important gains have been made to protect grizzly habitat in key parts of the Great Bear Rainforest, but the loss of complex old-growth forests continues through other parts of the coast. In the face of other looming threats, access to desirable habitat is increasingly important and protecting grizzly habitat immediately necessary.